Crunch, who is 13 feet, 2 inches long and weighs over 800 pounds, holds the world record for bite strength – 2,982 pounds! Just for the record, the Captain does NOT play well with others. He tends to prefer to keep to himself – and we let him. An average clutch size is around 35 eggs. 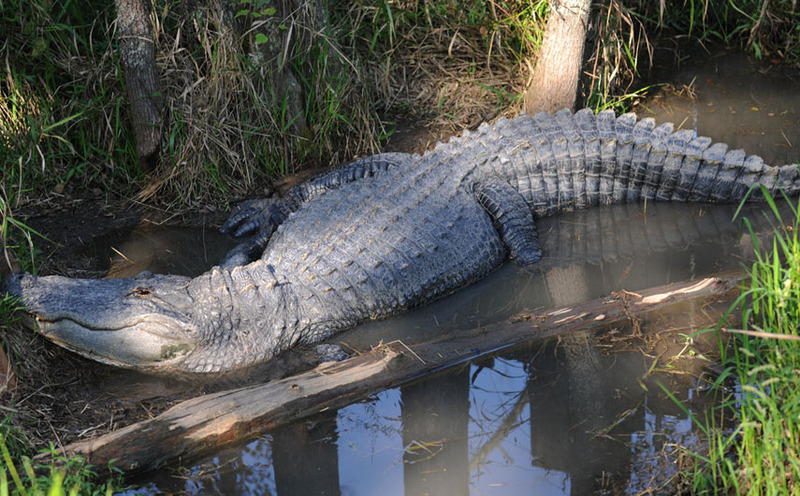 Large alligators can go as long as 18 months with no food! This length of time is rare but not impossible. Turtles make up the vast majority of an alligators diet, as do otters, beavers, snakes, frogs, birds and the occasional fish. Alligators are opportunistic eaters, meaning they eat whenever the opportunity presents itself. Alligators are not social creatures until breeding season comes around. They are cold blooded. Alligators often stay in groups called congregations. They are generally seen lounging in the sun or taking a swim together. Alligators have around 74 to 80 teeth in their jaws at any given time, and as they wear down or fall out they are replaced. An alligator can go through as many as 2,000 teeth or more in its lifetime! The easiest way distinguish between an alligator and a crocodile is by the shape of their noses. Alligators have a wide U-shaped, rounded snout, while a crocodile’s nose tends to be longer and more V-shaped. There are 24 different species of crocodilians.